NZ Backcountry Guides take pride in the fact that they are able to provide the best in trophy trout fishing and the best in free range fair chase hunting. For the sportsman, they provide the best in ethical hunting, where the trophy is in the taking, not the record book. 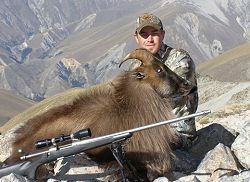 about our NZ Backcountry Guides - Himalayan Bull Tahr or Red Stag package. If you would like to pit your skills against the majestic Bull Tahr, agile Chamois, mighty Red Stag or cunning Fallow Buck, NZ Backcountry Guides offers free range, fair chase hunting on both public and private land and a limited number of Game Estate hunts. Free range, fair chase hunting in New Zealand is almost always strenuous, usually in rugged terrain, frequently time consuming and often dictated by the weather. In order to take a trophy at least 5-6 days on the hunting block are recommended. If time is short we are able to ensure a high success rate by utilizing either select private blocks, helicopter access or hunting on a Game Estate. See our photo gallery for NZ Backcountry Guides. Your guide will be Allan Kircher. Al has been fishing and hunting throughout the South Island backcountry since the early 70's. In 1985 he gave up his management position at a large South Island retailing company and embarked on a guiding career and has worked as a professional fishing and hunting guide since, both on his own account and often as a contract guide to several top guiding or outfitting companies. Between jobs Al has worked in the high country as a fencing contractor, possum monitor, beekeeper and farm hand. In 2007 he sold his own specialized clothing business, a business he had owned and operated over the winter months for the past 15 years. From a long association of working in the South Island backcountry, Al has established many long term relationships with landowners and farm managers that ensures there is a variety of properties that he can access for fishing and hunting. Passionate about clear water sight fishing, free range, fair chase hunting and goose and duck hunting, Al enjoys the alpine regions of the South Island backcountry as his adventure playground. Combine that with many years of experience and knowledge and you can rest assured that your fishing or hunting trip to New Zealand will be a successful and memorable one. Al is a qualified Mountain Safety Council Outdoor Leader and a member of both New Zealand Professional Fishing Guides Association and the New Zealand Professional Hunting Guides Association.